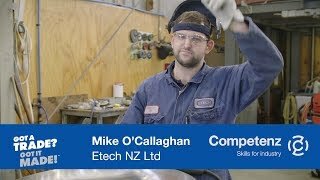 For Auckland Lock Services owner, Bryce Frewin, training an apprentice is not only great for his business; it’s a privilege to train the future of the locksmith industry. Bryce began as a locksmith apprentice when he was 16, starting a career pathway which sees him today as a business owner of 20 years. An apprenticeship plays an integral part in signing on new employees. “In our letter of employment we stipulate that if you’re suitable to do an apprenticeship, you’ll be offered one,” he says. Bryce had an employee who never gave up his dream of being an apprentice. Like with many trade industries, technology continues to have an impact. With a shortage of locksmiths throughout the country, Bryce says it’s important that other locksmith businesses take on apprentices. “I know a lot of people in this industry, and I ask them ‘Why don’t you have an apprentice?’ Five years into running my own business I brought in apprentices,” he says. Photo (left-right): Bryce Frewin and locksmith apprentice Cory Jensen.